The folks over at Guru3D appears to have mixed embargo dates and announced AMD Ryzen 5 series processors yesterday (opps)! AMD long ago said that the Ryzen 5 series was coming in Q2 2017 and it looks like they’ll be able to easily meet that with the new Ryzen 5 series that contains both 6-core, 12-thread processors along with 4-core, 8-thread processors. Don’t get too excited as you’ll have to wait until next month to buy one of the new AMD Ryzen 5 processors as they are available for sale on April 11th, 2017. 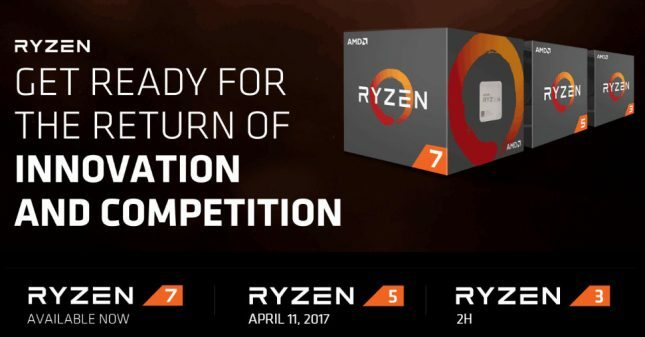 The lower-end AMD Ryzen 3 series is scheduled for release in the 2nd half of 2017 still. The AMD Ryzen 5 series consists of four new SKUs that range in price from $169 all the way up to $249. 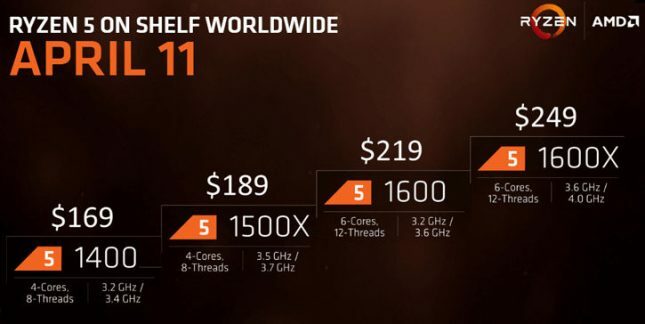 The AMD Ryzen 7 series starts at $329 and goes up to $499, so the the Ryzen 5 series is much more affordable due to the fact that it has fewer cores. The four AMD Ryzen 5 processors are the 1600X, 1600, 1500X and 1400. The Ryzen 5 1600X and Ryzen 5 1500X have eXtended Frequency Range (XFR) technology that allows the processor to boost beyond the rated boost clock if the temperatures allow it. 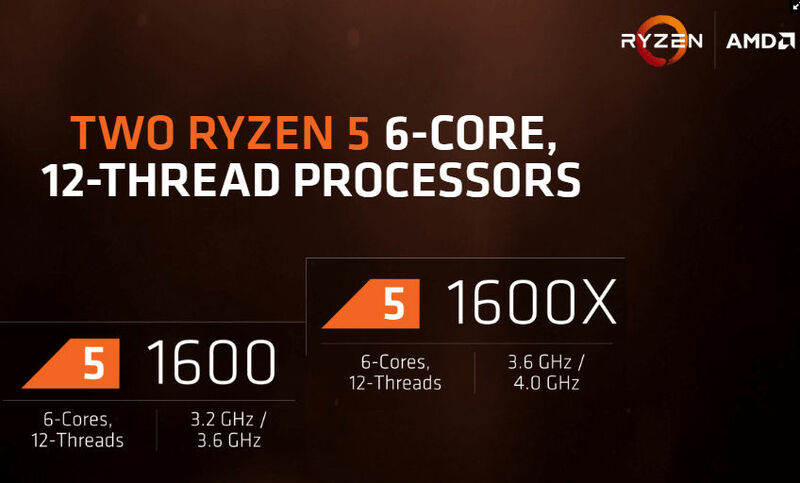 The AMD Ryzen 5 comes with the Wraith Stealth CPU cooler and the Ryzen 5 1500X and 1600 come with the Wraith Spire cooler as all are expected to be 65W TDP parts. The top-end Ryzen 5 1600X doesn’t appear to come with a cooler as it might be a 95W TDP part. The AMD Ryzen 5 1600X at $249 and the Ryzen 5 1600 at $219 are going to be much talked about as they have 6-cores and 12-threads for under $250 and the come with a Wraith CPU cooler. 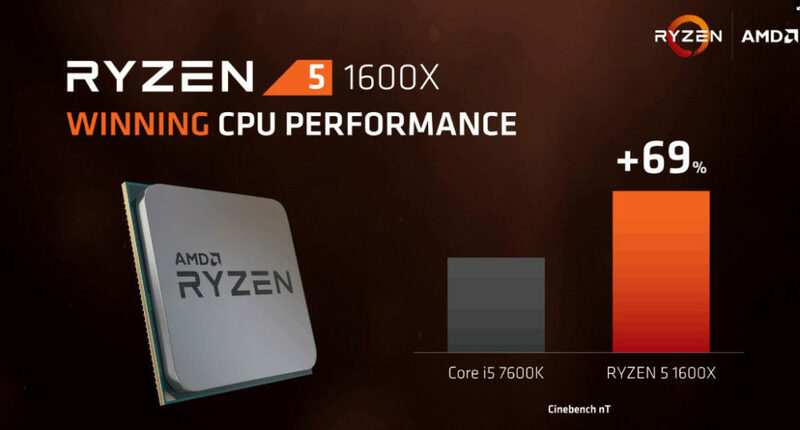 The clock speeds of the Ryzen 5 1600X 6-core processor are 3.6 GHz base and 4.0 GHz Turbo. This might have some worried as many were expecting AMD to be able to increase the clock speeds higher as they disabled cores. It doesn’t appear that the Ryzen 5 series processors will be getting a speed boost and since it uses the same Zen core architecture as the Ryzen 7 series we expect that overclocking will be similar and be reaching up to around 4.2 GHz on all cores. The folks over at Silicon Lottery started selling binned Ryzen 7 series processors and have so far found that only the top 26% of AMD Ryzen 7 1700 processors can hit 4.0GHz and 1.44V CPU Core Voltage or less. That number improves to 29% on the Ryzen 7 1700X and 73% on the Ryzen 7 1800X. To hit 4.1 GHz on an AMD Ryzen 7 1800X they found that only 21% of the processors they tested could reach that mark. So, there is a pretty big wall at 4 GHz is appears. Interesting data and if you want a known good overclocker be sure to check the guys over there out. We’ve talked with Preston over there for a few months and he seems like a straight up guy. When it comes to performance AMD Ryzen 5 1600X was compared to an Intel Core i5-7600K processor and was shown to beat it by 69% on the Cinebench R15 multi-CPU benchmark. 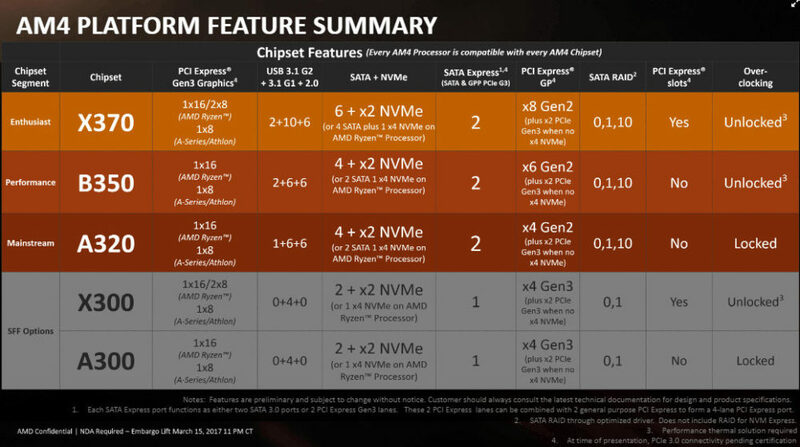 AMD Ryzen 5 processors use the same exact AM4 platform that is already available for the Ryzen 7 series, so enthusiasts will looking at either an X370 or B350 chipset based board. We’ve covered the differences the AMD AM4 chipsets already, so be sure to go back to this article if you need help picking the right board for you. It should be noted that all AMD Ryzen 5 processors are unlocked, so the should be fairly easy to overclock on an AMD X370, B350 or X300 series motherboard as those allow overclocking functionality in the UEFI. We can’t wait for April 11th to get here and to get some samples in to take a look at our on review platform! 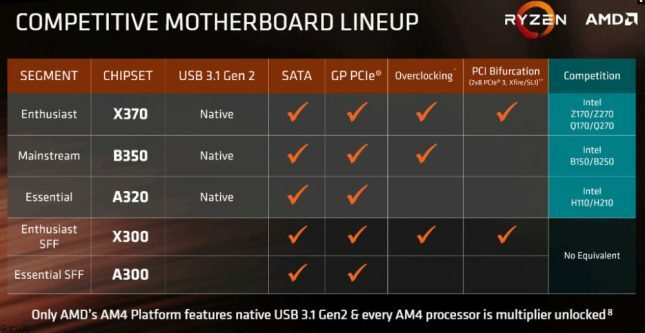 Where are all the AMD AM4 Motherboads?